The Couture Butterfly: Food Fun: Vanilla Root Beer Float! The one thing I love about summer is being able to really enjoy all the cold treats. I do have a tendency to eat ice cream and sorbet in the winter, but there is nothing like a root beer float - it screams summer time! One day I was in a convenience store that had the glass bottle sodas on sale. They really cool flavors like cherry limeade, grape, and my favorite blue cream soda. They also have a few different kinds of root beer, the regular kind and a vanilla root beer. I instantly craved a vanilla root beer float. So I will admit I tried the root beer before making it to a float to make sure it was good. I don't know if I'll ever buy it regular again! It gave the float an extra punch of flavor, but it didn't make it overly sweet. How did I make it? You wouldn't believe how quick it took. I think I spent more time savoring the float than I did making it! So this is the brand I used. I haven't seen any other brands that have this flavor so for now I'll keep buying this one. I scooped me up some lactose free vanilla ice cream in a vintage Coke glass and slowly poured in the soda. The key to an awesome float is how you pour the soda over the ice cream. If you pour it too fast it will end up on the counter. 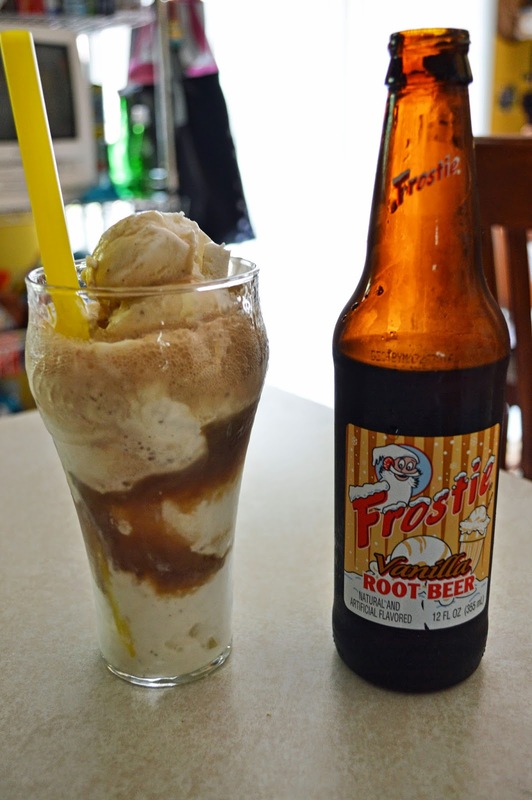 Poured over ice cream the root beer gets extra frothy so slow and steady gives you a better soda to ice cream ratio. And with that I happily enjoyed my float until the very last drop.